Cell is a basic unit of life. Living bodies are either single celled or multiple celled. New cell arise from existing cell. If you require in-depth information on cell for writing your assignment, get in touch with our online Biology tutors to seek cell biology homework help. They will research your topic of cell biology providing you exact information for writing your cell biology assignment. The two types of cells that is basically studied in Cell Biology are Prokaryotic cells and Eukaryotic cells. Prokaryotic cells: These are simple cells present mostly in unicellular organism that do not have nucleus. There is no membrane bound organelles in case of Prokaryotic cells. Though cell wall is present in prokaryotes, but chromosome is present in single loop only. BGA and bacteria are common examples. Eukaryotic cells: These are complex cells that include unicellular as well as multicellular organisms. Nucleus present in center of Eukaryotic cells contain genetic materials, therefore controlling most of the cell activity. Prokaryotic and Eukaryotic cell is basic yet an important topic in Cell Biology. Therefore, you are generally asked to explain this topic using diagrams. So in case if you are unable to connect diagrams with the description, drop an email to our team for cell biology homework help. They will help you get exact information for your work in short time period. 1. Cell membrane forms a protecting covering around the cell, therefore checking the entry and exit of substances in and out of the cell. The lipid bilayer that is made of phospholipid molecule makes cell membrane selectively permeable. 2. The lipid bilayer contains thousands of cell membrane proteins. This membrane proteins are either peripheral proteins or integral proteins. Peripheral protein can be found on external and internal surface of the membrane whereas integral protein either extend inside or extend outside of cell membrane, therefore they are exposed to inside and outside environment of the cell. 3. The phospholipid bilayer in a cell membrane that squeezes protein from both side gives the appearance of mosaic to the cell membrane, this theory also termed as fluid mosaic theory. These are few basic points included in study of cell biology. Though these points only provide glimpse of different topic, but the extended information can be obtained from textbooks. At Urgenthomework.com we aim to help students in their cell biology assignment. Whether you are stuck in between your work or you are in need of relevant image for the provided topic or else if you want to get your homework rechecked, you can come to us without hesitation. We have learned tutors and skillful writers. They work as a team to provide answers to your doubts. No matter how difficult your question is, you will get your doubts on cell biology cleared in few hours. Just get in live chat with our team, discuss your queries with the biology tutor, when you are convinced by their work, submit your further queries and get answer timely to complete your homework. Cell Biology has lots of important topics. The through study of these topics are important to gain knowledge of every portion of this subject. Protein sorting is an essential topic in cell biology. It is the process of directing protein within or outside the cell at specific locations. Proteins are basically target to cytosol, nucleus, mitochondria, Endoplasmic reticulum, Peroxisomes and chloroplast. While cytosol do not require targeting signals, other subcellular compartments require one or more signal for transport of protein. Cell cycle is another important topic in cell biology that tells about the division of cell and its advancement towards every further step. It is basically divided into two main processes: Mitosis and Meiosis. Mitosis takes place in vegetative cells whereas meiosis takes place in reproductive cells. Mitosis is further classified into different stages namely Prophase, Metaphase, Anaphase and Telophase whereas meiosis is differentiated into Meiosis 1 and Meiosis 2. Further Meiosis 1 is sub-classified into Prophase 1 (Leptotene, Zygotene, Pachytene, Diplotene and Diakinesis) metaphase 1, anaphase 1 and telophase 1. Meiosis 2 on the other hand is similar to Mitosis that undergoes four basic steps. Therefore at the end, the process of mitosis give two daughter cells with same number of chromosome as present in the parent cell whereas as the end of meiosis, 4 daughter cells are produced with half the number of chromosomes than that of the parent cell. This topic is very extensive with lots of important information about cell, its structure and its growth. So it is an important topic of assignment given in schools and colleges. If you are not able to organize the information to clearly describe the process, get in touch with our assignment help team. We will make your concept clear through well-prepared presentations and videos. Likewise, protein folding, cell types, cell structures, cell activities etc. are other important topics in cell biology in which you can seek homework help from our learned tutors. 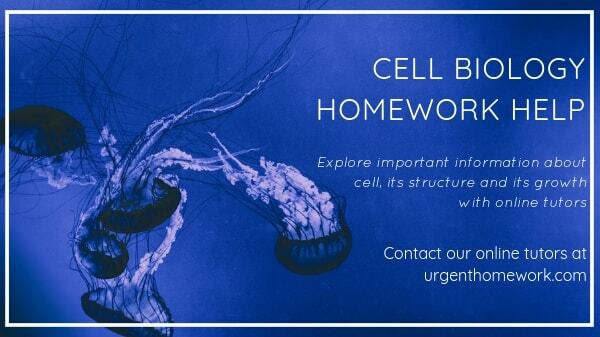 Cell biology homework help is available 24/7 for students. So you can put up your homework related query anytime and get reply from our learned team. We provide well researched content along with information that are written by tutors. Therefore, no copied work as permitted by our homework help site.